Patrick Troughton took over the role of the Doctor in 1966. He replaced the outgoing popular star of the show – William Hartnell, in something of a unprecedented move in TV. Could it work? Could a successful show carry on, with a different actor in the same lead role? Troughton was an experienced TV performer, having appeared in many TV series and movies. He had starred as Robin Hood in a 1953 TV series, and had appeared in the sword and sandals epic – Jason and the Argonauts – 1963. Initially, Troughton wasn’t so sure if he could pull off this replacement act – but the more he talked it over with the producers and Hartnell himself, he began to flesh out his vision for the character. Then script editor – Gerry Davis, had in mind the character played by James Stewart in the film Destry Ride Again -1939 – a man who would recount a parable rather than answer a straight question, then leave others to work out its meaning. This character-facet of the Doctor has stuck with every Doctor upto present day and still forms one of the Doctor’s most mysterious and enigmatic qualities. Troughton had the idea of a Charlie Chaplin-esque buffoon sryle character and between him and Sydney Newman (the show’s creator) – they settled on a “cosmic hobo” style image and manner, complete with a bang update cool Beatle-esque haircut for the second Doctor. Troughton bought an insatiable curiosity to the role, an absent minded bumbling professor quality and a healthy dose of humour. He took the basic qualities of personality that Hartnell had established and gave them real dramatic verve, swinging from one emotion to the other, with irreverent forgetfulness. Every Doctor has since attempted to capture this facet in their own interpretation of the Doctor – and as we shall find out in future bio’s, some were better at it than others. It was Troughton’s era that began to shape the mythos which had been non-existent in Hartnell’s era. It was learned that the Doctor was a Time Lord, that he was from the planet Gallifrey, in The War Games – 1969 and he could regenerate frequently (obviously as he just had!!). Furthermore, Troughton introduced the second Doctor’s staple trademarks; a tall hat and flute. The hat was quickly abandoned but the flute was kept. He played it endlessly whilst he mused over a problem or life threatening situation – as if it seemed to help him think. The sonic screwdriver also made its first appearance in The Fury From The Deep, the device which would become so synonymous with the Doctor. The Doctor also inherited his “John Smith” alias, in The Wheel In Space – 1968 . Whilst Jamie was being interrogated as to the Doctor’s identity and Jamie seeking inspiration from a computer panel logo – inscribed with John Smith. 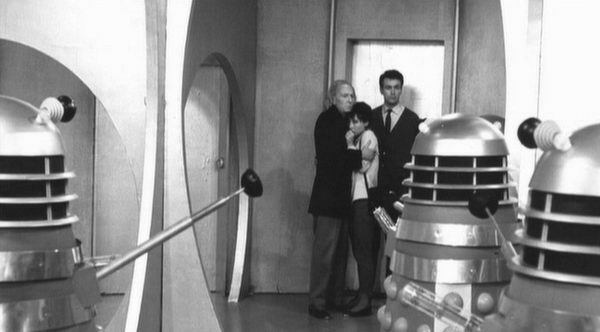 In Yroughton’s first adventure, the Second Doctor was really up against it in – The Power of the Daleks – 1966 which saw him pitted against his mortal enemies – the Dalek’s; having came out of his first regeneration with the first trademark post regeneration confusion disorder (which was to be explored more in future regenerations). The production team made a few changes behind the scene’s too. Out went the overly preachy Historical Earth episodes and in came – monsters! Lots and lots of Monsters! Troughton’s second season was dubbed “The Monster era”. The Doctor was pitted against many varied aliens in season two : Cybermen (4 times! ), Daleks, The Yeti, Ice Warriors, Seaweed Creatures, Dominators and Quarks. The stories were more science fiction driven than previous and involved travelling to many different planets and far off space stations. Moonbase – the blueprint story for much of later Who to follow. The Moonbase – 1967 set the basic template for future stories – being a siege-story-line story about a group of humans, cut off from reinforcement and being systematically picked off by an unknown foe (In The Moonbase‘s case – Cybermen). This story was used many times over and over again. (The Wheel In Space – 1968 followed in the Troughton era). The Doctor’s inital companions were Hartnell’s – Ben and Polly (two salt of the earth types) – the last companions of Hartnell. The Doctor then picked up Jacobite Jamie McCrimmon in the serial The Highlanders – 1966 and Zoey in the serial The Wheel In Space – 1968. The Doctor also travelled briefly with a young girl called Victoria, an earth girl from the 19th century who he met in Evil Of The Daleks. Season 6, saw the Doctor meet Army Colonel Lethbridge-Stewart in The Web of Fear – 1968 and again in The Invasion – 1968; having been promoted – to Brigadier and now overseeing UNIT taskforce. UNIT were formed, as a result of continual alien invasion. They were the scientific/military wing of the government; to understand alien life. UNIT and the Brigadier would feature much more heavily in Jon Pertwee’s reign – onwards. Troughton even got the chance to stretch his acting by playing both the Doctor and the evil villain called Salamander in The Enemy of the World – 1967. In The War Games – 1969 the Doctor finds himself in the middle of a warzone, featuring human soldiers kidnapped to play out macarbre war games for the delight of their captors. The Doctor realising that he cannot hope to save everyone involved, contacts the Timelords for aid, but in doing so leads himself back into their clutches to finally answer for his crimes. The Timelords judge the Doctor and sentence him into exile on earth with his Tardis travel controls locked, forcing him to choose a new face – to which he refuses. His companions are then forcibly returned to their own time periods and their minds are wiped. And so ended Troughton’s time in the role. Troughton found the filming schedule consistently gruelling and as a serious actor, was always worried about being typecast. His legacy was the true modern base for almost all of Who mythology to date. However, this was a double edged sword in itself – as by revealing some more of his past, some of the mystery and wonder about the character was lost. That said, The War Games was a fitting end to Troughton’s era and one can’t help but feel sorry for the Doctor, as he returned home to answer for his not-really-so-evil crimes and received the ultimate sanction; no time travel. Troughton’s warmth and sense of responsibility always shone through, in the role. His comic playfulness and ditzyness was his overriding quality but he also had a streak of seriousness which permeated his moods. Generally Troughton played tongue-in-cheek, even when angry; which was more exasperation than actual anger. If the aloof Grandad was Hartnell, then Troughton was the kindly Uncle. Troughton reprised the role in three Doctor cross over adventures; The Three Doctors – 1973, The Five Doctors – 1983, The Two Doctors – 1986. Troughton sadly died making personal appearances whilst touring the Who Sci Fi fan circuit in Atlanta, America – in 1987.